Since 2004, TSH, in association with the European Hematology Association (EHA) and the European Council for Accreditation in Hematology (ECAH), has awarded Continuing Medical Education (CME) accreditation points for participation in scientific and education programs. EHA applied for a Leonardo Da Vinci network grant at the European Commission. 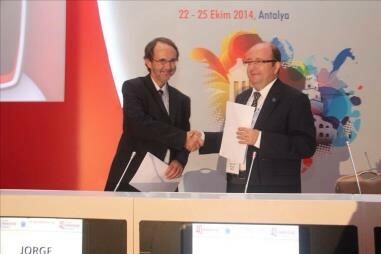 Turkish Society of Hematology is one of the 26 partners at this project. EHA established in 2007, to pursue one of the deliverables from the previous LdV ECAH project, a network for communication with the National Societies (NS) focused around specialist training and competence in hematology. This network of CRs, each appointed by their NS, aims to pursue implementation of the CV-Passport at the national and regional level and to gain extra value through intra-European communication and sharing of experience. Project completed with success. After this project TSH takes place at master classes. There are 2 mentors from Turkey and 12 graduates from master classes. JACIE's primary aim is to promote high quality patient care and laboratory performance in haematopoietic stem cell collection, processing and transplantation centers through an internationally recognized system of accreditation. First JACIE Course was held during National Hematology Congress in 2008. TSH last year organized forth course in the 8th Turkish National Bone Marrow Transplantation and Stem Cell Therapies Congress in Antalya, Turkey in 2014. ProMISe (Project Manager Internet Server) is the central data management system used by the EBMT. Users are able to enter and retrieve data directly over a secure Internet connection. All users access the same copy of the entire project, but users have the option to download their own centre database for reference purposes. First ProMISe course was held on September 2008 during National Hematology Congress. And the forth course was held successfully in the 8th Turkish National Bone Marrow Transplantation and Stem Cell Therapies Congress in Antalya, Turkey in 2014. First certification program for nurses working in the field of bone marrow transplantation was held in 2008 during the 34th National Hematology Congress. Last education course was held during the 8th Turkish National Bone Marrow Transplantation and Stem Cell Therapies Congress in Antalya, Turkey in 2014.